Bacalaitos is known as one of the best Spanish appetizers. Seafood meets pancake in this savory appetizer that is the perfect appetizer recipe for a crowd in the warmer months. If you’re Puerto Rican or had the pleasure of visiting the Island or even a community with a deep Puerto Rican heritage, you’ve most likely have been served bacalaitos Goya at some point. They’re flavorful and convenient to make. But homemade bacalaitos will always win. Am I right, or am I right? The flavor profile of bacalaitos is fresh and bold. 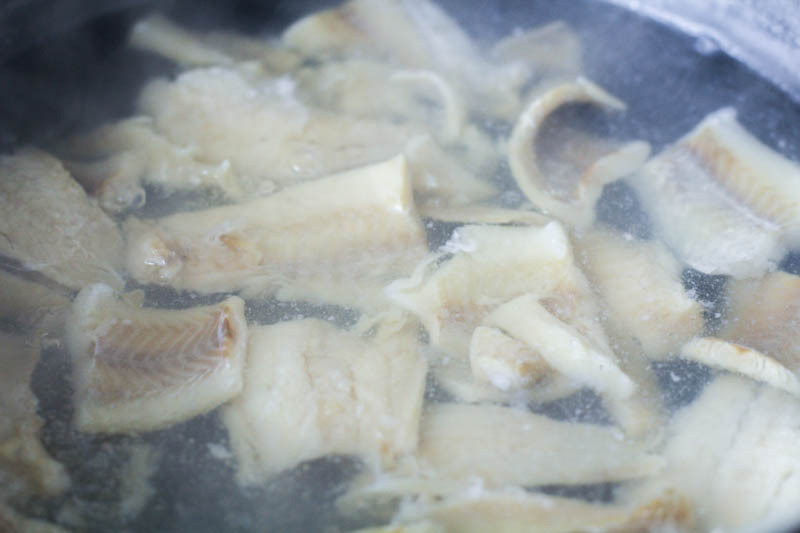 The key to ensuring you have the best bacalaitos recipe is to soak the codfish overnight in water. This ensures you do not have a “too salty” bacalaitos batch. Once you’ve drained the codfish resoak it for another hour or two. You do want some natural salt, but the salted pollock is highly concentrated in salt. Two separate soaks does the trick. When making fresh bacalaitos, fresh ingredients is key. Add finely chopped onions, red pepper, cilantro, and some oregano (this can be dried). Bacalaitos has the convenience of being a hand holding appetizer just like empanadas, but it’s like a savory pancake. Light and fluffy, and the flavor is seriously out of this world with boldness! You can easily make a ketchup mayo sauce or even a garlic aioli to take it up another notch. First, it starts with choosing your fish. I’m choosing these boneless and skinless salted Pollock Chunks. The main thing is making sure it is salted (and in my case, boneless and skinless). 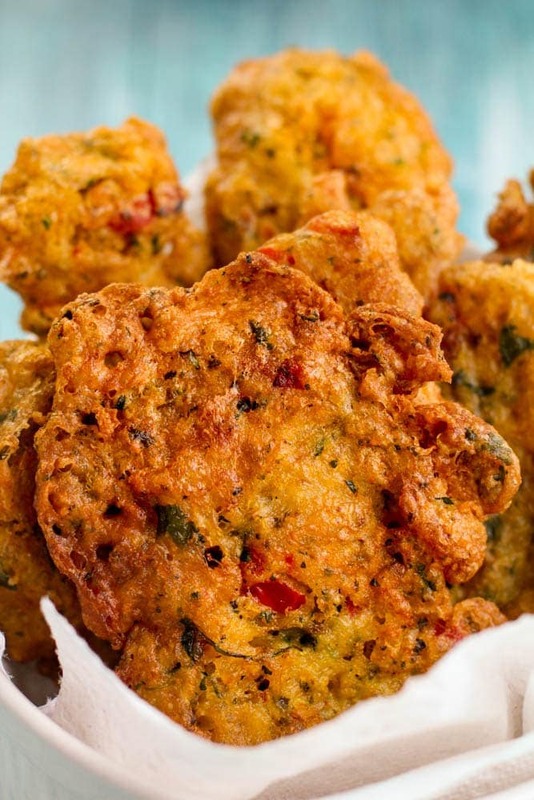 This fish is the go to for an authentic Puerto Rican bacalaitos recipe. I highly suggest you let the fish take a water bath for a few hours. Which looks like first rinsing the fish, then putting it into a bowl with fresh water, and changing the water every three hours. Have the fish refrigerated for this water bath. Do this for a total of 6 hours. Next, you’re going to put your fish into a pan with 3 cups of water and a teaspoon of white vinegar. Over medium high, let it come to a boil and simmer for five minutes. Then remove pan from heat and let it cool enough to touch. While the fish is cooling, you’ll work on your batter. 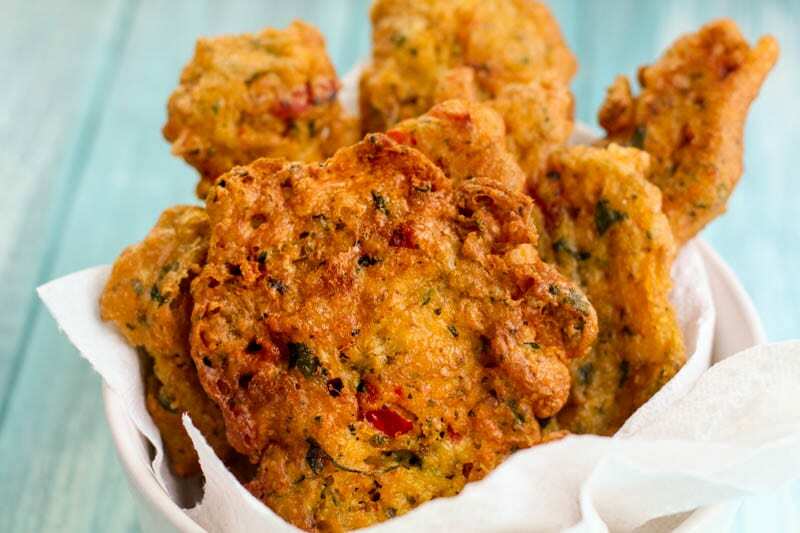 Take two cups of white all purpose flour, and add in fresh chopped parsley, fresh chopped cilantro, fresh chopped onions, fresh chopped red bell pepper, some oregano, 1/4 packet of sazon or Bijol for coloring, black pepper, and 1 1/2 teaspoons of baking soda. I also add a little homemade sofrito, but that’s optional. Mix it and wait. Now that the fish has cooled, you’re going to break it up as finely as desired. But reserve the water! So this looks like pouring the fish into a separate bowl using a colander and saving 1 cup of the salt water. 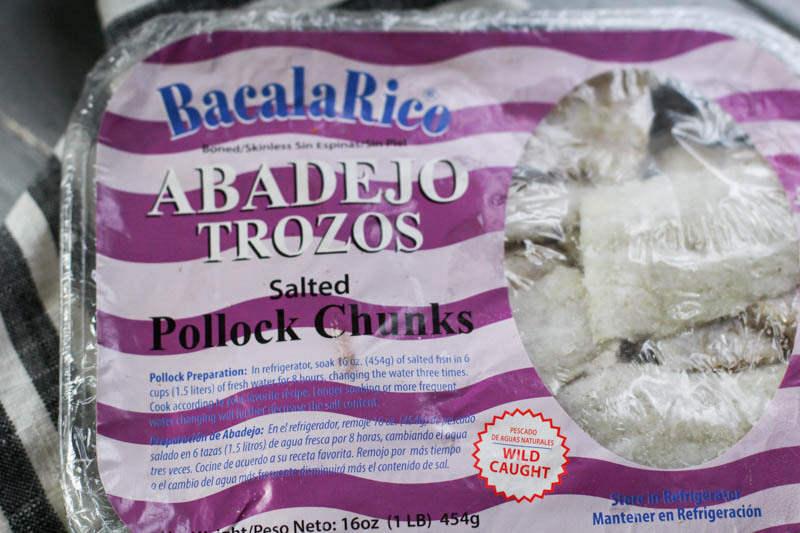 This helps preserve the taste of the fish for the bacalaitos. Add in 1 cup of the bacalaitos water into the flour mixture and mix. Next add in 1 to 1 1/2 cups of fresh water into the mix. The thinner the batter, the crispier the bacalaitos. Mix it all to form a pancake like batter and fold in the fish. I suggest letting it sit for about 5-10 minutes before frying it. When you fry it, add in about a 1/4 cup and don’t just dump it in like a pancake, try to make it into a line. Fry it until the edges are golden colored before flipping it over. About 2 minutes per side. Now that’s how you make codfish fritters! I’m apart of some amazing Puerto Rican recipes groups on Facebook and I posed the question of “should I add eggs to my bacalaitos” and the overwhelming response was no. So I ask you mi gente, do you add eggs to your bacalaitos? If so, or not, I want to hear from you in the comments below. As always, buen provecho! 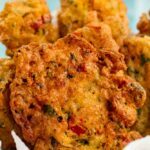 A Latin codfish fritter, this flavorful finger food is perfect for gatherings and is completely flavorful and seafood lover approved. Rinse fish thoroughly before placing into a bowl of water. Refrigerate for 3 hours, then drain water and add fresh water. Repeat 1 more time. Drain water after the second 3 hour round. Place fish into a pot with 3 cups of water and vinegar. Bring water to a boil, lower heat to a simmer and cook for 10 minutes. Remove pot from heat and let water cool. Meanwhile, in a large bowl add in remaining ingredients, except for the water. Next, using a colander, drain fish into a new bowl, and reserve 1 cup of the salted fish water. Using your hands, shred fish as finely as desired. Add the 1 cup of salted water to the flour mixture, and mix together. Next, slowly add an additional cup of fresh water to the mixture. For a thinner and crispier bacalaito, add in up to another cup of fresh water. 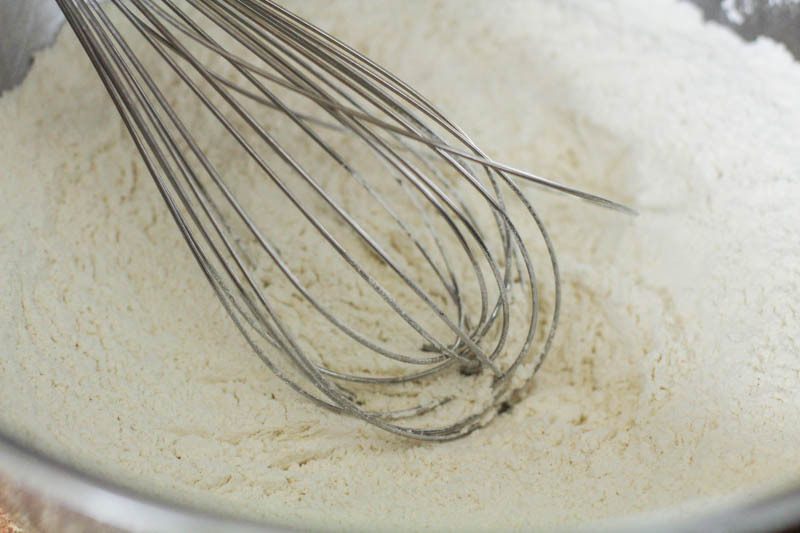 Mix together to form a pancake like batter. Next, fold in your fish and let batter sit for ten minutes. After 10 minutes, to a frying pan add in 1 1/2 inches of vegetable oil for frying. Once oil is hot, ladle in 1/4 cup of batter, in a long stride to create a long bacalaito. Fry until edges are lightly brown, and flip over. Cooking for 2-3 minutes per side, or longer for a crispier bacalaito.